Last week I made a complete ‘hash’ of explaining innovation capital. I made a set of basic mistakes in my preparation and my delivery. I allowed for little discussion and debate and I just ‘blasted’ on regardless. I’ve been standing in the innovation ‘sins’ corner most of this week. I can honestly say I don’t feel so good about this failure at the moment and I thought a more public ‘confession’ was in order. I will also let the ones that suffered from this also know how I feel.I made such a simple set of basic mistakes. I’m still asking myself why and have been slowly working through it to get to the bottom of my ‘aberration’ moment. Let me share some of this with you as learning from failure is as important as celebrating success. The story could easily go……”well it was simply one of those days…to much coffee beforehand, being distracted by other issues……” No, those should simply not happen. Somehow I forgot some basics and then some more but I’m certainly never too old to (re)learn and own up to this. Let me explain, I was asked my opinion in a thirty minute exchange on innovation capital. It was not my finest thirty minutes. Often you know this is not going right but often more times than not you simply ignore all those internal warning signals going off in your determination to get all your points across. In the end, no one gains from this. This was not the time or place to expand on emerging theories or even recently acquired additional thought. Certainly not from me, who had been sought out to offer a ‘considered’ opinion in the first place about innovation capital only. So what went wrong? I tend to fall into the camp of over preparing (for anything). In this case I not only went beyond refreshing all I was thinking on “what makes up innovation capital” but I decided to link it into the bigger picture. Now, there is no problem on doing that but not for a short 30 minute exchange. That was not the right vehicle to expand and broaden out any discussion; this could have been left for future ones. I well and truly got well ahead of myself. In my refreshing and reflecting beforehand I came across some different strands of thought that I simply ‘climbed into’ for my own understanding, referencing and future work. Of course the mistake I made was to then want to bring this straight into the discussion, moving the need to explain innovation capital quickly off the table and straight into the linkage into how it creates the value creation through the identification of the dynamics within the system. I got caught up in some of my own discoveries, linking far more to some other work I had been undertaking recently. Not only did I want to link into value creation but I needed to throw into the ‘pot’ the importance of the Business Model as well. So here I am attempting to construct the entire value structure when all I had been asked was to expand on innovation capital. I still kept going. Of yes, three strikes and you are usually out right? Well in this case I was going for a forth one. I began to argue that the whole debate about intellectual capital needed reframing, so can you image the layering on process I was subjecting my poor listeners too, all in a short 30 minute discussion. So at the end of the thirty minute session I think there were some glazed looks. I suddenly realized this had spun out of control from my side and I’d really lost sight of the actual need, I’d gone way, way beyond. Not a good moment that even after so many years this can happen. It shouldn’t but it did. Certainly a little humbling to say the least, and certainly not one of my finest, for those at the other end I wonder what they felt. I think I need to find out, I just hope they will be still talking to me. So what is innovation capital? I opened up the discussion with this but I then failed to explain all its connected parts and its value. 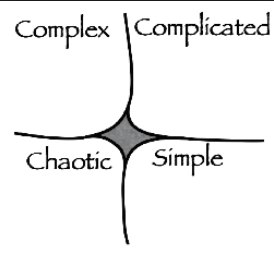 I’m not sure if you know of David Snowden’s Cynefin framework? The framework sets out five types of problems, realities, or systems, it provides a typology of contexts that guides what sort of explanations or solutions might apply. Simple, in which the relationship between cause and effect is obvious to all, the approach is to Sense – Categorise – Respond and we can apply best practice. Why do I bring this framework into this? Well in some ways I tried to ‘race around’ all five of its domains in thirty minutes and did not stop to think of this great framing model to stop me and focus on where innovation capital can fit. Actually I did not even mention this Cynefin framework as I had not recognized what I was actually trying to do, which was actually not the brief either – mistake five. Although it could have been used to explain its value to work around where different innovation capital can fit and what might ‘make up’ the capital parts. Instead of explaining the simple casual relationships of innovation capital, I went tumbling into the complicated, layering on the complex and then descended into the chaotic state of promoting the argument for novel practice and then I suspect ending in disorder (in all minds I would feel). Not my finest thirty minutes, sometimes we make ‘things’ more complicated than they need to be or even were expected in the initial question! Mistake six. Making six identified mistakes and still counting…oh boy! It hurts!